TWM has been following Olenka and the Autumn Lovers for a couple years now, and it’s been very rewarding to see them grown their audience and continue releasing awesome tunes. Their live show just gets better and better, and they’ve got a new album in the works, along with a lot of work building the arts scene in London, Ontario. Olenka gave us a nice chunk of info about the band, touring and why she wants to stay in the Forest City. 1. What bands are you looking forward to catching at NXNE? Welllllll…. i was really hoping to see Zeus, cuz I’m currently obsessed w/ them, but apparently they’re playing at exactly the same time as us at the Radio 2 showcase so BOOOOO. Aside from them, well, I couldn’t really be called a music fan if i didn’t try to catch Iggy & the Stooges on Saturday, but I’ll probably be trampled by the masses… Saturday I’m going to head out to the Radio 3 showcase at least for a bit to catch Library Voices and Hannah Georgas, not sure if Bruce Peninsula are on the that bill too, but I think so; we’re good friends w/ some of the Saskatooners, and we were supposed to play w/ Hannah on our recent tour, but that fell through b/c of the van dying, and Bruce Peninsula are dear to our hearts. I’ll probably also try to catch Rah Rah, Timber Timbre, The Magic, The Winks, Evening Hymns, and Leif Vollebekk. I’m also curious to see Julianna Barwick; we share a mutual friend and a long long time ago we tried to set up a show together in Brooklyn, so it’d be nice to catch up and see where she’s taken her music. 2. I remember your set at Bread and Circus during nxne last year—it was the first time I ever saw your band include drums. How has that addition changed your music? We are now a fully fledged rock outfit and can kill it like the E Street Band. Kinda. Haha. Basically it’s opened up our music to even greater variety: we can put on a rock show and play louder and/or dancier songs, but we can also throw in songs w/ just me and the girls or me by myself and totally change the mood; I really like that we’re able to provide that kind of variety — it just depends on the setting. 3. Your MySpace notes that you are working on a new album. When do you expect it to be released? Fingers-crossed we’re aiming for autumn 2010 (yes, how fitting you might say)…I’m still trying to keep us on track for a September release, but I’m prepared for the likelihood of a delay (these things always take longer than you imagine). 4. What is the recording process like for your band? It’s changed w/ every recording, mostly out of necessity (timeframe, financial constraints, etc.). We started recording for this album w/ Andy Magoffin at his London studio (House of Miracles); we weren’t really sure how we were going to approach it going in (tracking or live-off-the-floor), but as we started setting up for our sessions, we kinda fell into tracking individual instruments, w/ Dan (drummer) and I doing all the bedtracks and everyone else layering over top. We had a lot of guest musicians come in and add parts here and there, so the eight songs that we’ve started w/ Andy will be very full of luscious instrumentation. We’re also planning to about five more songs in different settings, probably live: for songs that are more sparse in arrangement or just involve me and the girls or me solo. 5. You are a part of the Open House Arts Collective in London. Can you tell us a little bit about that? We’re a collective of artists, musicians, art enthusiasts and community organizers; all the projects that we take on are meant to support and inspire the local scene. We have quite a strong community of creative people out here, and when we started the collective we were hoping to find ways to bring the London community into more of a spotlight. We organize music and art shows (including an annual Spring music festival: Oh! Fest), and we help to develop and produce individual projects (like albums) for local musicians and artists; people can check out what we’re up to at the following link: http://wwwopenhouseartscollective.com. 6. You have a strong music/arts community in London, do you feel the pull to move to a bigger city as your band grows or can you stay put? London is really a home to us. The people here have been amazingly supportive; I feel compelled to stay here and continue to help the scene thrive. As for the larger cities, they’re nice to tour through and visit, and we certainly have a blast hanging out in them when we do tour through, but it’s nice to go back to a city the size of London and feel like we’re doing something really vital and groundbreaking for the local community; it’s nice to help shine the spotlight on this town every now and then, seeing as it really has been the support of so many of the people here (including Oh!, CHRW, the LFP, EVAC, LOLA, and the APK) that has bolstered our success. 7. You recently toured out west for the first time; can you share a good tour story? Well, have you heard the one about the van…? You know, the one that was fully loaded w/ gear and spirited Autumn Lovers, which two blocks away from home decided to give up the ghost?…I guess that doesn’t really qualify as a tour-story, since the goddamn thing didn’t even make it on the tour…letseeee a good tour story…at the start of the tour we found out about our first show of the tour (in Winnipeg) about 20 minutes outside of the city (we had a bunch of cancellations and reschedulings due to the van-crisis) and ended up playing w/ the Darcys at Mondragon and became fast friends and ended off the night at the best ever loft dance party the likes of which Winnipeg will probably never see again. That was pretty fortuitous and super fun…what else…our show at All Citizens in Bruno, Saskatchewan was really nice; Tyler Brett (the owner/operator of the space) was really kind and has two of the sweetest pets, and they gave us an award for touring through! A handmade embossed little plaque! Um…what else…the girls and I were almost trampled by a small herd of Bighorn Sheep outside of Golden BC…OH! and we saw a bear! So many animals on this tour.. the great Canadian wilderness was out in full force. 8. What is the best food you had a chance to consume while on tour? Ryan Drabble (of Slow Down Molasses) is kind of a food guru…we actually suggested that he start up a food-blog for touring musicians: Ryan’s Pick (haha). We’ll see if he takes us up on the offer…anyway, he provided us with a few quality meals while we were in Saskatoon recording a few odds and ends for the next SDM album. But aside from Drabble-Dining, I did manage to have some excellent sushi while in Vancouver (couldn’t resist), and we had some amazing Chinese food in Edmonton: we went to a really crazy late-night Chinese food place with Doug Hoyer and some of his bandmates & friends called the All Happy Family Restaurant…its logo is a smiley face: genius. 9. Do you have any good music festival stories to share? All the big festivals are pretty crazy — you end up getting lost in a frenzy of activity…I really enjoyed coming out to Sackville in the winter for CHMA’s Stereophonic festival (it’s a smaller festival that the campus station organizes); I got a chance to hang out in the city w/ all the touring musicians and locals and even go hiking through snow-covered plains w/ Pat LePoidevin and a friend of his. 10. Does being a woman in the Canadian music scene present any challenges? I haven’t noticed too many obstacles really; i suppose there may have been more difficulties a decade ago or so, but the current music industry is so individually motivated that it seems that gender doesn’t really play all that much of a role in success and support as it may have in the past. I guess I do notice every now and then how many guys are involved in the industry: it does sometimes seem that there are more men than women playing in bands and working in the biz, so perhaps there are still obstacles inherent to the industry model that don’t provide for genuine gender equality, but I’ve never encountered any real problems as a result of being a woman musician, moreso as a result of being an independent musician in an industry that is still reeling in response to huge industry changes like home-recording, digital distribution, online-booking, and the social media movement. 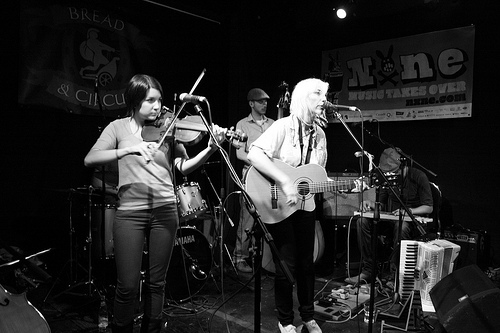 Olenka and the Autumn Lovers are playing NXNE at 10PM on June 17 at the Gladstone, for the NxEW showcase.